Embark on a fun-filled frenzy of electromechanical experimentation, all under software control! In the old days, an experimenter needed a pile of transistors, capacitors, digital revolution where it could all be done with a system on a chip, a soldering iron and a breadboard. The introduction of the Arduino microprocessor gave experimenters the ability to easily sense and control the world using software. The Arduino gives you a way to talk to the real world of light, temperature and motion. The typical experimenter's setup is a breadboard with a bunch of holes in it with wires sticking out everywhere. It can be quite intimidating to a person who only knows software. And today's experimenters don't toil away alone in their basement. They want to take their creations to a friend's house or a meet-up and show it off. Unfortunately, those old breadboards don't travel well. The tangle of wires easily come loose. At a meet-up, you can spend more time figuring out which wire came loose than you do showing off your great invention. Experimenters have had a stable software platform for some time. This Bread Box provides a stable physical platform for your work and introduces a new level of portability to your rig. 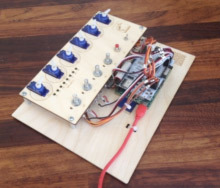 The Bread Box kit contains a number of servo motors, potentiometers (like a volume control) and switches that will be wired up and held in place. You can place your finished Bread Box kit into a real box and take it with you as you go experimenting. This kit does not include any microprocessors; you'll have to supply them, but you probably already have one! 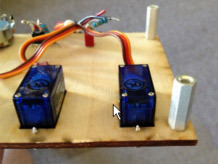 The Bread Box is designed for use with an Arduino and a shield. It works well with a Raspberry Pi and Arduino Alamode, Uno or Duemilanove and a sensor shield. You can certainly use it with any microprocessors you want. Adventurous experimenters will enjoy the physical stability the Bread Box offers. If you'd like to build with the optional Raspberry Pi LED kit, click here. Verify that you have all the parts ready for building the kit. Wrap one wire number around the far end of each servo cable, about one inch from the three pin connector. Each servo has a number tag on the end of its cable. The top of the bread box has a number by each rectangular hole. Start by placing the servo numbered 3 into the hole numbered D3. The servos go in from the top so that the little "horns" sit on top of the Bread Box board. You will have to wiggle the servo a little bit to get it to fit through the hole; a little gentle pressure is all you should need. Use the mounting screws to secure the servo to the bread box top. Mount the other servos making sure that the numbered servos go in the correspondingly labeled hole. This step is optional, but a nicely laid out set of wires makes the kit look more professional. Turn the bread box top over so that you are looking at the bottom of the servos. 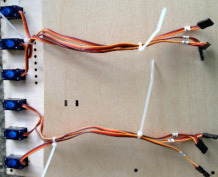 Take the cables from the left three servos (9, 10, 11) and gather them together. Align the connectors so they are all together. Place one cable tie about 2 inches from the end of the servo cables. Pull it snug, but don't damage the wires. "Monkey tight, not gorilla tight," we like to say. Now use the wire cutters to trim the end of the cable tie. Place a second cable tie about 5 inches up the wires. Pull it snug and trim the end of the cable tie. On the right side of the bread box top you do the same thing with the other three servos (3, 5, 6). See the picture of the finished dressed cables. Stretch the three cables out in front of you. For each cable you will need to measure closely, cut the cable and then place a wire numbering tag on each near the connector. Use the ruler to measure one cable 7.5 inches from the very end. Cut this cable there. Do not place a numbering tag on it. Measure another cable 6.5 inches from the very end. Cut this cable there. Put the wire numbering tag of 1 on this cable. The longest is about 5.5 inches. Put wire numbering tag 2 on it. The shortest is about 4 inches long. Put the wire tag 4 on it. The remaining piece is about 5 inches long. Put wire tag 3 on it. Take the toggle switch and remove the nuts on the shaft. Place the switch in the hole for A5. Discard the split lock washer (or save it for another project!). Put the nut on top of the board and tighten the nut by hand. Once the nut is snug, align the switch body to the same orientation as the servo bodies. Make sure the two solder lugs are away from the servos. Now use the pliers to give the nut an extra little twist to be tight. Take the pushbutton switch and remove the nuts from the shaft. Place the switch into the hole labeled A4. Place the nut on the shaft. Tighten it up. Using the wire cutters, gently nip between the wires at the cut end of the cable so that you can pull them apart. Pull them about 1 inch apart. Strip the two outside wires. Do not strip the center wire. Trim both ends of the leads on each resistor so they are about 0.5 inches long. Twist one end of the resistor together with the BLACK wire from one cable. You can use either end of the resistor, it doesn't matter. Solder the connection. Do the same to the other cable with the other resistor. Taking the number 4 cable, solder the free end of the resistor to one of the lugs on the pushbutton switch. Solder the other stripped wire (WHITE) to the other lug of the push button. Do the same for the number 5 cable and the toggle switch. 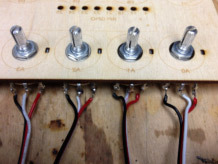 Remove the nuts and washers from the shaft of each potentiometer. 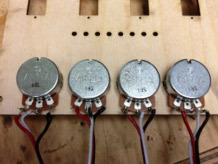 Place one potentiometer in each of the holes labeled A0 - A3. Note that each potentiometer has a registration tab that fits into the corresponding rectangular hole. Place the flat washer and nut on each potentiometer shaft and tighten. Place the Bread Box top assembly upside down in front of you. Use wire cutters to gently nip between the wires on the end of each of the cables. Pull the cable wires apart so that you have about 1 inch of free wire at the end of each cable. Strip the ends from all three wires on all four cables. Turn the bread box top over so that you see the bodies of the servos. Place a screw in one of the four mounting holes and attach a spacer to the other side. Tighten it. Do the same for the other three mounting holes. Place the bread box bottom on the table in front of you with the etched side up. Place the bread box top assembly on the bottom with the cables all coming out towards you between the two closest spacers. Place a screw in each mounting hole and attach the top to the bottom securely. Download the latest test program and copy it into your Arduino IDE. The test program moves the servos as you turn the potentiometer knobs. Now that you see it work, you can do anything you want. If you want to write programs on the Raspberry Pi to control LEDs, but you don't want a rat's nest of wires all over the place, this LED kit solves the problem! Eight green LEDs are neatly lined up, ready for your commands. A short cable connects the RPi's GPIO pins to the board bringing all the power and control lines right to the LEDs. The kit includes mounting holes so you can attach it to something else. This kit is easy to assemble – you just need to do a little soldering, then you're immediately ready to show off your programming prowess in the blink of eight LEDs. Place the circuit board on the table in front of you with the square outline facing up. Place the short end of all 26 header pins into the circuit board. A small piece of tape can be used to hold the pins in place. Now solder the header pins in place. Turn the board over so that the connector is on the bottom. Place the resistors on the OPPOSITE side of the board from the connector. Locate the holes for the eight resistors. Bend the wires for the resistors, place them in the holes and solder them in place. The LEDs will go on the circuit board on the SAME side as the resistors. Locate the eight pairs of holes. Note that each LED has two leads, one of them slightly longer than the other. The longer lead is the (+) lead. The longer (+) lead MUST go in the hole that is closest to the resistor for each LED position. If you plan to use your GPIO LED board with the Shrimpware Bread Box, then you need to mount each LED slightly above the PCB. The leads are bent about 1/8th inch below the board. The photo on the right shows the LED pushed up into the position where it is ready to be soldered. 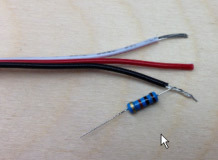 Another clever technique is to place a small plastic wire tie under each LED as shown in the photo. This allows you to get all the LEDs the same distance above the PCB. Once you have soldered the LEDs in place, you can easily remove the wire tie. Before connecting the GPIO LED board to your Raspberry Pi, you need to carefully inspect it. Look at each solder pad and make sure that there is no solder crossing between pads. This is particularly important at the 26-pin connector. Any solder that bridges two pins is a possible way to permanently damage your Raspberry Pi. If you have an ohm meter, you can test the resistance between the ground pin and the 5VDC pin; there should be infinite resistance. Also check between the ground pin and the 3.3VDC pin; there should be infinite resistance too. If either of these tests fail, you should not connect you GPIO LED board to your Raspberry Pi. 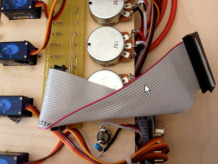 Once you are sure that the GPIO LED board is correctly assembled, connect the ribbon cable to the 26-pin connector. Connect the cable so that the white stripe is near the LEDs and resistors. Now put a turn into the cable as shown in the photo above. On the Raspberry Pi, the other end of the cable attaches to the 26-pin GPIO connector. On the RPi, the white stripe goes towards the edge of the Raspberry Pi. Now open a remote desktop to your RPi and bring up the Raspberry Pi store application. Download the free WebIOPi application. When it is installed, go to the My Software tab in the RPi store and double click the WebIOPi application. In a minute this will bring up the WebIOPi control page. Your LEDs are connected to GPIO numbers 17, 18, 21, 22, 23, 24 and 25. 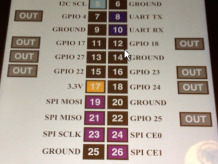 (Note that in the WebIOPi screen shot to the right, pin 13 is incorrectly labeled GPIO 27. It should be GPIO 21.) On the WebIOPi page, click to make the pins OUT. Then click the little square of each pin and see the corresponding LED light up. The LEDs for this board press fit into the holes in the bread Box. If you have an electronics story or electronics tech tip you'd like to share, please email MyS[email protected].